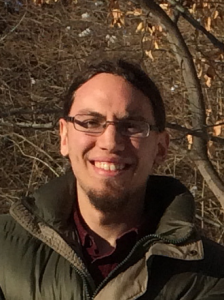 Jeffrey Binder is a PhD student in English at CUNY who specializes in transatlantic Romanticism, intellectual history, media studies, and digital humanities. Jeff comes to the humanities from a background in computer programming, and much of his work involves putting new digital technologies into dialogue with their historical precedents. His dissertation, “Symbols Purely Mechanical: Language, Modernity, and the Rise of the Algorithm, 1605-1862,” provides a historical perspective on algorithms—the mechanical problem-solving procedures that now govern social-media feeds and search engines—in the context of the Baconian tradition of combating the uncertainty of words, showing that the relation of algorithms to the language of daily life was a major point of philosophical and political contention during the Enlightenment and its aftermath. With Collin Jennings, a PhD candidate in English at NYU, Jeff developed the Networked Corpus, which provides a new way of navigating texts using the statistical method known as topic modeling. Based on this software, Jeff and Collin created an environment that allows the detailed comparison of a topic model with the subject index from the 1784 edition of Adam Smith’s The Wealth of Nations. They found that these two technologies, despite their superficial similarities, represent the contents of a text in radically different ways. Jeff and Collin have presented on this project at MLA 2014 and published two papers on it, one appearing in Literary and Linguistic Computing, the other in ELH. At the New Media Lab, Jeff is working on two projects. The first, the Distance Machine, is a computer program that identifies points where particular texts diverge from broad patterns of historical language change in large digital archives. Jeff has employed the Distance Machine in a study of Walt Whitman’s use of technical vocabulary in Leaves of Grass, which he discusses in an article published in American Literature, and in a presentation about representations of land in the transatlantic eighteenth century at NEMLA 2017. His second project at the New Media Lab examines eighteenth-century elocution manuals in relation to contemporary debates surrounding the circulation of affect on social media; for this project, he is analyzing the annotations contained in an eighteenth-century text about speaking with emotion alongside contemporary techniques for quantifying the emotional valences of words.